2013 Chairman’s Address | FEED, Inc.
On behalf of our NGO FEED, it is an honor to commemorate this special day with you under the direction of the United Nations to heighten increased awareness of the environment, everywhere we go. Recently, the need to promote more Earth and eco-friendly practices in our daily lives in order to maintain the health and well-being of our planet and its people has come to the forefront. World nations, organizations, volunteer jungle warriors and other environmental leaders are struggling to reverse the present trend of climate change, all factors being connected. World Environment Day is a reminder to express and share our gratitude to Mother Nature, who sustains all forms of life. Today, we also acknowledge the significance of focusing our thoughts and energies on ensuring wider scale impact – by means of converging our respective efforts with like-minded pioneers, such as UPLB and the Philippine Army. 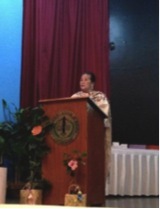 FEED, or Fostering Education & Environment for Development, has always envisioned the full reversal in fact return of the sustainable management of the Philippines biodiversity rich resources, including the preservation of our forests and the development of livelihoods for our people, particularly those living with nature but without the means to generate an appropriate and sustainable living. The only way we could and can achieve our shared vision was and is through collaboration and by engaging all relevant stakeholders, from the general public to private, NGO, government and individuals. 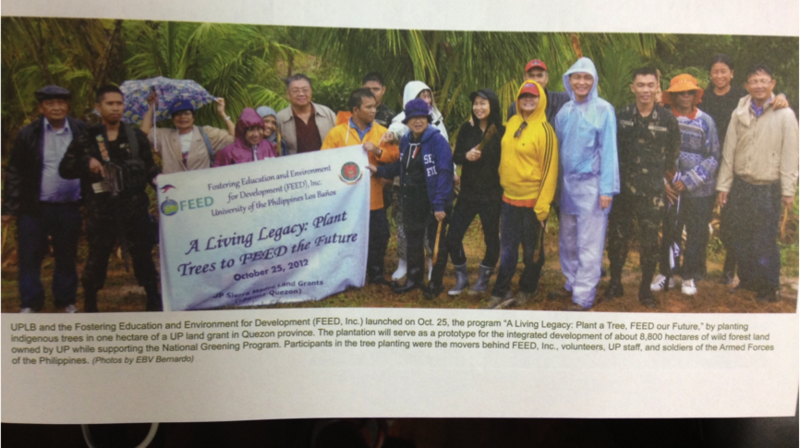 “LIVING LEGACY: Plant a Tree, FEED Our Future” program. 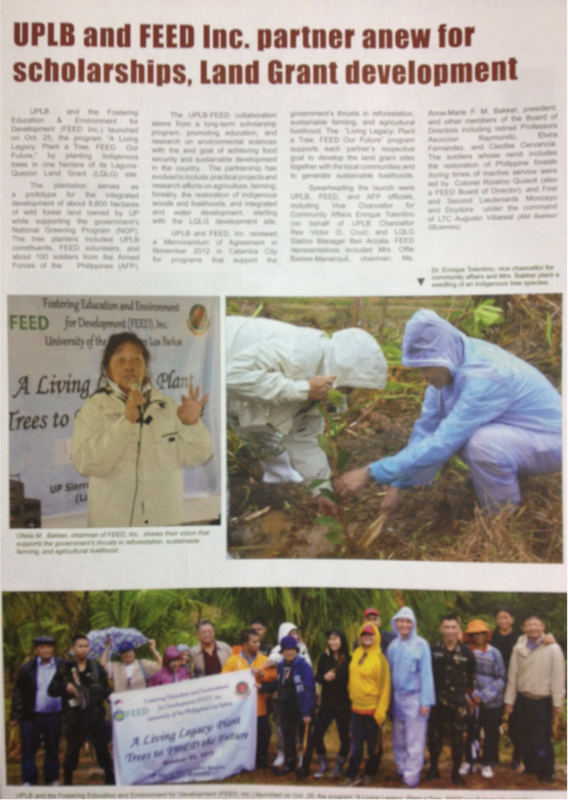 At FEED, where we also provide scholarships to students at UPLB in the fields of environmental sciences, our mantra is: “Greening the Philippines: One Scholar and One Tree at a Time”. As you can imagine, with the majority of our natural habitats, including fora and fauna at risk of extinction, the urgency to achieve wider-scale impacts is crucial, which is why we also work parallel to the Philippines National Development Plan 2011-2016 Education & Environmental targets in aiming to ensure alignment with the global Millennium Development Goals and agenda, where relevant. Through this special cooperation, the conservation and protection of environment and love for nature is alive and kicking, finally returning to our ethos and culture. We plan to re-instigate such universal values into our highly reputable education system by engaging all stakeholders in our projects. Together, we treat the environment and each other with sanctity, because we know that by doing otherwise, we may risk all to peril – which is unacceptable, especially knowing “We Do Not Inherit the Earth from Our Ancestors; We Borrow It from Our Children”. World Environment Day is just one out of 365 days – an annual wake-up call and an urgent appeal to each one of us to recognize the significance of the role we each play towards conserving our environment and healthier lifestyles. Our beloved Philippines is a nation rich in biodiversity, one dependent on its people – those who carry precious traditional knowledge and wisdom in the CONVERSATION between nature and humanity’s sustenance.